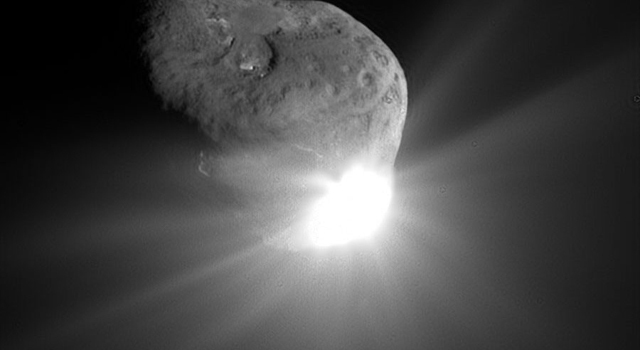 This spectacular image of comet Tempel 1 was taken 67 seconds after it obliterated Deep Impact’s impactor spacecraft (Credits: NASA/JPL-Caltech/UMD). Bhaskaran will present his latest findings on guidance for hypervelocity impacts on Tuesday, April 16, at the International Academy of Astronautics’ Planetary Defense Conference in Flagstaff, Ariz.
JPL manages the Near-Earth Object Program Office for NASA’s Science Mission Directorate in Washington. Steve Chesley of JPL is leading the Impactor for Surface and Interior Science (ISIS) mission proposal. JPL is a division of the California Institute of Technology in Pasadena. NASA’s Goddard Space Flight Center, Greenbelt, Md., manages the OSIRIS-Rex project. More information about asteroids and near-Earth objects is at: http://www.jpl.nasa.gov/asteroidwatch , and on Twitter: @asteroidwatch.